Before the start of last season, Josh Heard decided he was not ready to use his MLS opportunity with the Vancouver Whitecaps. Instead, he came to Bethlehem Steel FC. Heard started nine games, plus 13 substitute appearances, for just under a thousand minutes on the pitch in 2016. He scored twice. Early in 2016, his performances suggested he judged himself correctly as a USL-caliber player. But the better form that succeeded in his later performances hint that Vancouver may have missed out. He was also considerably leaner-looking in recent YSC practices than he had been at a Chester scrimmage 11 months earlier. And his three assists against Junior Lone Star FC Wednesday, February 22nd make that hint to Vancouver somewhat larger. Heard is strong, whether on the ball or off it. He displays excellent ball control with both feet and his body. And these are not the strongest parts of his game. His strongest parts are mental. He is tenacious, tough, and courageous. In the attacking penalty box he has no regard for his own physical safety. He is fully committed to score, or to help others do so. For Steel fans, the high point of Heard’s 2016 season came against Pittsburgh on July 10th at Goodman Stadium. He received a pass in the left channel with a Riverhounds defender tight on his back. The next thing fans heard was the Riverhounds player yelling in indignation, arms extended, after Josh had out muscled him to win the ball, pinned him with an arm hook, and turned him outside. Heard then dribbled in toward goal, wrong-footed the keeper, and scored. That yell was music to Bethlehem’s ears. Heard lacks elite pace, and therefore needs to raise his physical condition from excellent to beyond superb. His physical stature disadvantages him in contests of leverage, but a wide base on strong legs helps compensate. He does not beat defenders 1 v 1 with his feet as well as, say, Ilson Jr., or teammate Santi Moar (although few do). It had to be quite a disappointment to be insufficiently recovered from injury to start at Rochester last May 28. The Steel played that day without any Union loanees, providing a rare opportunity for the regular Steel bench. Heard only played the last 14 minutes. Once he was fully game fit, he was a first choice starter if there were no flank midfielders sent down from the Union. 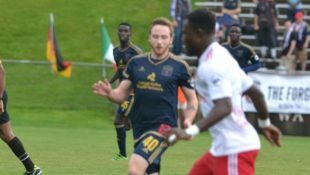 He is the best flank midfielder to survive into 2017 from Bethlehem Steel’s own USL roster. He began as a central spine midfield reserve, but switched to the flank when Bolu Akinyode, Derrick Jones, and James Chambers came to dominate the central channel’s starting line-up. Given the expected sparseness of the Steel’s 2017 core roster, Heard’s positional versatility will be of great usefulness to coach Brendan Burke. He lacks the pace of the flank midfield speed boys, first-teamer Eric Ayuk and academician Justin McMaster, but has the strength and ball command to turn his defender. He repeatedly shows a Welshman’s tenacity and physical self-sacrifice in going towards goal in the box. In a dire emergency he could probably learn to play a flank back, a position at which the Steel may experience significant future youth national team call-ups. That move would depend on whether coach Burke is allowed to keep his flank back trialists by roster considerations. The Union themselves are currently flush with wide midfielders. But Heard will become an excellent player in USL if he sees the field enough, and he should at least continue in the league whether it be with the Steel or elsewhere. Thank you for the insightful summary, Tim. +1 BSFC profile pieces are a nice idea.